It's been said that the World Cup has only been won single-handedly on two occasions, by Diego Maradona in 1986 and Garrincha in 1962. Although this might be hyperbole, the fact is that without Garrincha it's hard to believe that Brazil would have defended their World Cup title in Chile. Manuel Francisco dos Santos, better known as Garrincha (Portuguese for Little Bird) was a controversial selection for the 1958 World Cup. Born in Rio de Janeiro in 1933, despite a deformed spine and legs that bent inwards, the right winger for Botafogo was one of the best dribblers that Brazilian football had ever seen. Standing at a height of barely 5 foot 6, Garrincha's outrageous skill on the ball, in combination with his sense of mischief, made him difficult to fit into a team structure though. Always believing that it was better to drag the ball back and beat an opponent twice, rather than take a more direct option, he could frustrate teammates and opponents alike. After being left out of the first few matches in the 1958 tournament in Sweden, he found himself back in the Brazil side against the USSR, and along with a 17 year old by the name of Pele, inspired Brazil to their first World Cup title. Garrincha was named to the best eleven of the tournament, and unsurprisingly he was the subject of numerous transfer requests from clubs such as AC Milan, Juventus, and Real Madrid. Staying with Botafogo, Garrincha began to exhibit the problems with alcohol that would plague him until the end of his short life. A series of reckless incidents, including running over his father while drunk driving, and a string of high profile extramarital affairs, saw Garrincha dropped from the national side. 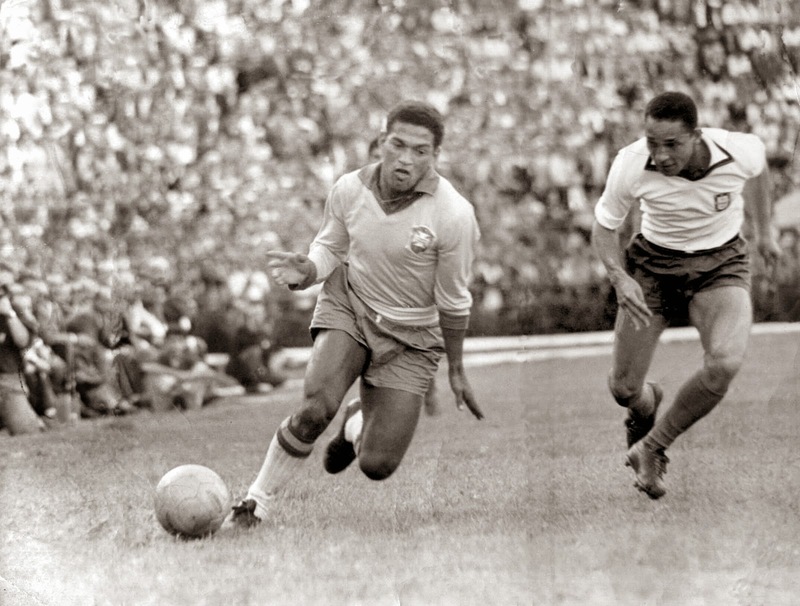 Despite his personal problems, Garrincha continued to star for Botafogo though and eventually found his way back into the Seleção Brasileira in time for the 1962 World Cup in Chile. With Pele knocked out of the tournament after the second match, Garrincha took the team on his back as they beat Spain in their final group fixture to set up a Quarter Final showdown with England. Mesmerizing the England back line, Garrincha led Brazil to a 3-1 victory with two goals and an assist for Vava. Besides his second goal, a brilliant "banana shot" from the edge of the box, Garrincha is also remembered for adopting a new canine friend after this match. During the action, a stray dog ran on the pitch and was picked up by England forward Jimmy Greaves. The four legged intruder then proceeded to urinate all over his kit. Finding the incident funny, Garrincha adopted the dog and took him back to Brazil. 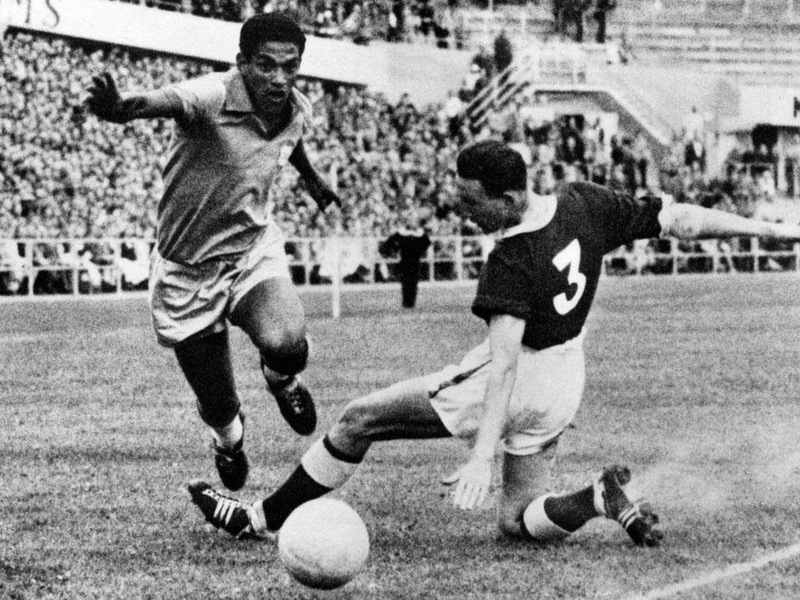 In a fiery Semi Final against the hosts Chile, Garrincha again found the net twice to send Brazil through to the final. Although he was sent off in the 83rd minute, Garrincha was not suspended for the final. In securing Brazil's second consecutive World Cup title, thanks to a 3-1 win over Czechoslovakia in the Final, the "Little Bird" was named as the Player of the Tournament. Although, history views him in Pele's shadow, Alegria do Povo is still viewed by older Brazilian fans as someone who was a man of the people, that overcame personal struggles to become one of the greatest players of all time and was a key part of the country's first two World Cup wins.